We will strongly recommend a self guided tour where you will get the possibility to discover our beautiful archipelago. You will find us in Grönemad, Grebbestad, Ekenäs, Sydkoster & Rossö in Koster marine national park, please have a look at our directions. If you don’t have previous experience we recommend a guided day tour or camping tour and if you need to update your skills you can start with a kayak intro tour or more advanced course. If you plan to go kayaking with your children or grandchildren we have guided family tours. We have small maps you can borrow and larger maps for sale at our main center i Grönemad, Grebbestad. You can also download maps from lantmateriet and Eniro. When you rent a kayak from Skärgårdsidyllen, you also have the possibility to test/borrow a tent from Swedemount for free. The only counter-claim we aspect is that you follow the rules of public access and take a picture of you and the tent and let us publish on our site and social media. We recommend only having the tents up between 6pm and 9 am. Here is a great broshure with the essential paddling tips for canoists. Here is also information about lighting fires in nature. In our area there are a lot of beautiful islands and skerries around our main center in Grönemad, Grebbestad as well as our pickup point kayak station at Ekenäs, Sydkoster. If it is difficult to choose wich archipelago to paddle, it is possible to paddle between the two centers during a couple of days and enjoy both if the weather permits alternatively book a few days from each centre. 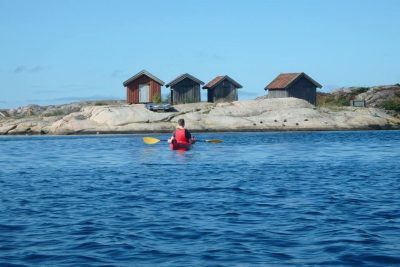 Here you can read a recommended tour Grebbestad day tour, Grebbestad & Fjällbacka 3-5 days, Grebbestad & Koster 3-6 days or be inspired by one of our guests writing about going to Koster and back in 5 days or out Australian guests that did a 12 day downwind from Lysekil to Strömstad. In the following links you will get tips and suggestions about cosy islands and skerries you should experience, suggestions on tent sites, outdoor toilets and what to do if there are no toilets. Did you know that we have a project called “Hållbar skärgård” (sustainable archipelago) that builds outdoor toilets and create a structure for a sustainable tourism in the archipelago. Please contact us if you would like to know more, get involved or support us. 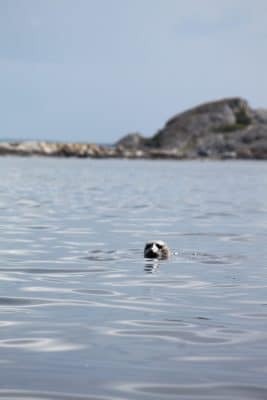 When you are stay in the archipelago it is of great importance that you respect the bird/seal protection areas, seal protection areas, animal & plant protecion areas and the Right of Public Access. There are special regulations for the natural reservoir as Väderöarna and Kosterhavet National Park among others. Bring extra water and food if the weather makes you stay out longer than planned and an extra set of clothes and mobile in a dry bag in case you get wet. Here is also a suggestion of outdoor meals and packlist with things to bring, We can help you with boat taxi and kayak transport. Finally we will recomed you to have a look at some of our inspirational movies and articles.